2011-2012 through The Swedish National Public Art Council commission for an artistic configuration of the new travelcenter in Nora. (In collaboration with Karin Tyrefors). 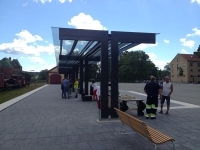 2012-2013 through The Swedish National Public Art Council commission for an artistic configuration of Lilla torget (the Small square) in Nora.